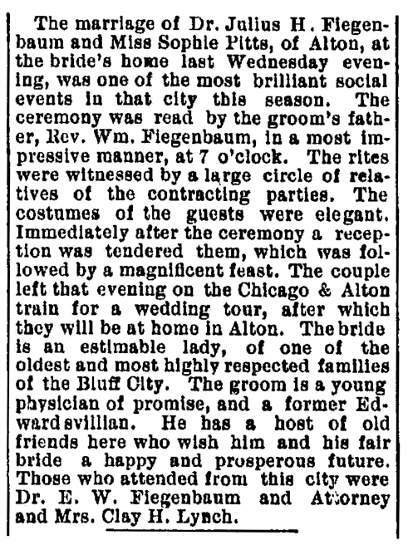 The marriage of Dr. Julius H. Fiegenbaum and Miss Sophie Pitts, of Alton, at the bride's home last Wednesday evening, was one of the most brilliant social events in that city this season. The ceremony was read by the groom's father, Rev. Wm. Fiegenbaum, in a most impressive manner, at 7 o'clock. The rites were witnessed by a large circle of relatives of the contracting parties. The costumes of the guests were elegant. Immediately after the ceremony a reception was tendered them, which was followed by a magnificent feast. The couple left that evening on the Chicago & Alton train for a wedding tour, after which they well be at home in Alton. The bride is an estimable lady, of one of the oldest and most highly respected families of the Bluff City. The groom is a young physician of promise, and a former Edwardsvillian. He has a host of old friends here who wish him and his fair bride a happy and prosperous future. Those who attended from this city were Dr. E. W. Fiegenbaum and Attorney and Mrs. Clay H. Lynch. Source: Edwardsville Intelligencer (Edwardsville, Illinois); Wednesday, 18 September 1889, page 1. Dr. Julius Henry Fiegenbaum graduated from Bellevue Hospital Medical College (later New York University School of Medicine) on 9 March 1885 and set up his practice in Alton, Illinois. He and Sophie Elizabeth Pitts were married in Alton on 11 September 1889. The ceremony was conducted by the groom's father, Rev. Herman Wilhelm Fiegenbaum, a minister in the German Methodist Church. Two wedding guests are mentioned by name, probably because they would be known to many readers of the Edwardsville Intelligencer. Dr. Edward William Fiegenbaum was one of the groom's brothers and practiced medicine in Edwardsville. He had graduated from Bellevue Hospital Medical College, New York, in 1876. Attorney Clay Hardin Lynch was the husband of one of the groom's sisters, Martha Lizette Fiegenbaum.